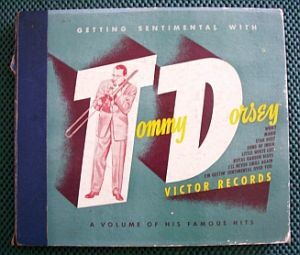 Here is an album of four double sided 78 RPM records by Tommy Dorsey. Condition is fair to good with the usual minor surface scuff marks and scratches for a record set of this age. The center holes are in good condition except record #2 with has some slight chipping. The spine is missing part of the top and torn on the bottom.